Remembrance Day is a time of reflection and an opportunity to learn about our country’s military history. Using primary source documents, you can create a story map to highlight important events that occurred in conflicts that Canadians have participated in. Find out how Esri Canada’s very own, Robert Alldritt documented his grandfather’s World War I history through letters and photos in a story map, and learn some of the tips and tricks he picked up in the process. Remembrance Day is a time of reflection and learning. Consider creating a story map using primary source documents to tell a story that’s connected to a historic event that Canadians have participated in. A great example of this was created by Robert Alldritt from Esri Canada. Five years ago, Robert inherited several boxes from his father containing photos and letters from his grandfather, William A. Alldritt’s life during WWI. The boxes had been in his dad’s possession for many years. Robert had to figure out how he was going to manage this wealth of information. After going through the contents and researching the time period, he decided to highlight some of the important things he discovered in a story map titled, William A. Alldritt: Ten months in a life, August 1914 - May 1915. Using the map journal template, Robert’s purpose was to tell a compelling story that doesn’t necessarily follow a linear time line. He tied together many references to William A. Alldritt (sometimes appearing as Aldritt) that already existed in published and web format, and introduced unpublished information that his family possessed. He also wanted to tell a ‘self-narrating’ story that gathered the ‘voices’ from various primary source documents that included letters, journal entries and articles, to bring the story to life and avoid using third-party narration where possible. Robert’s story map titled William A. Alldritt: Ten months in a life, August 1914 - May 1915 highlights some of the primary source documents he discovered from his grandfather’s life during WWI. As Robert worked through the story map project, he implemented some useful ways to handle the large amount of information he wanted to present. Robert colour-coded hyperlinks in the text to help the reader prioritize the links to explore. He chose to use colours, taking inspiration from the categories used in the maps in Michelin tourist guides. Since the story map cites many external and academic references, Robert created hyperlinks that link to footnotes found in another section of the story map. Robert colour-coded links in cyan, magenta and yellow to help readers prioritize the links they want to explore. Looking into the future, Robert would like to document the full life of his grandfather, who lived from 1881 to 1933. He plans to cover different aspects of William A. Alldritt’s life, including his experience as a prisoner of war (POW), which was recently featured in a Maclean’s article, and his involvement with the Winnipeg Toilers Basketball Club. We look forward to seeing more story maps that will enrich our understanding of life during war time and encourage students to learn more about their country’s history. 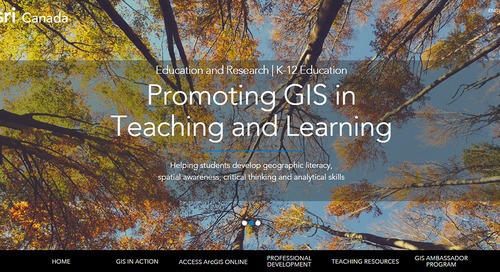 Contact k12@esri.ca if you would like to connect with Robert.